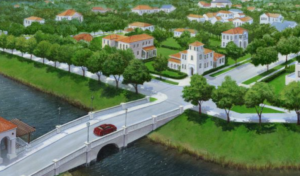 Plans at the City of Palm Beach Gardens are moving forward for the approval of the newest community Avenir. The former Vavrus Ranch property north of Northlake Blvd is proposed to have 3,735 homes and an additional 250 townhomes. The current plans call for 2,407 acres to the city of Palm Beach Gardens for Conservation. Rosa Schechter and Avenir Holdings principal says this land set aside will connect about 100,00 acres of conservation land from the east coast to Lake Okeechobee helping Everglades’s restoration. Avenir Holdings has also a dedication of 50 acres to the city of Palm Beach Gardens This land could be used to accommodate up to 500,00 square feet of economic development, which would allow the city to lure corporate headquarters, which has gained the support of the Palm Beach County Chamber of Commerce and the economic counsel of Palm Beach County. Avenir plans to include 2 million square feet of office space, including 200,000 square feet of medical office space, 400,000 square feet of retail space, a 300 room hotel, plus 15 acres for schools and 55 acres for parks. There will also be an additional 75 acres set aside for police/fire/city annex and civic recreation use. Landstar Development has built more than 17 communities in south Florida and 18 communities in central Florida and well over 30 communities outside of Florida. They are a group of partners who offer hands on approach to each development. Anvenir is being represented by local attorney Steve Mathsion on PGA Blvd in Palm Beach Gardens, FL.